Technology is the perfect assistant…until you can afford a live one. Technology is great in many aspects, though it can be overwhelming for some. One thing I highly recommend to those I consult and in my new book, Tips On Creating a Successful Naturopathic Practice, is to face that fear of technology and use it to your advantage, especially for those just starting out. There are so many helpful programs and applications (apps) out there that can help you use your time more efficiently so that you can spend more time seeing patients – which is why we’re all here, right? Sometimes these programs are included in your electronic medical record (EMR), free of charge. However, if you don’t like the way it works, or if you aren’t using an EMR yet, there are several options out there. These can save a lot of phone time as patients can schedule visits, refills, blood draws and specialty appointments all at the click of a mouse without having to play phone tag. This has been a huge time-saver for my practice as most of my patients schedule appointments after hours or on the weekends. It’s also nice to have a program that takes credit card information so you can charge for no-shows or late-cancellations automatically (which significantly reduces the risk). Social media is a great way to engage your audience for both current and future patients, but it can also send you down a black hole of wasted time if you get too caught up in posting everything you find on the Internet. It’s important to have an online presence and social media is a great way to stay current and prove your worth as a respected health resource. Engaging, original content is best, but reposting studies and recipes can also help attract followers. Using a social media scheduler can significantly reduce the time spent managing your various accounts by combining them all in one spot. Buffer for example, allows you to set the times you want to post throughout the week and you can grab stuff from the web, RSS feeds or news apps like Feedly and it will schedule your posts automatically for Facebook, Twitter, LinkedIn, Google+ and App.net. These programs also have analytics incorporated in them so you can see what types of posts do well and what you should stop wasting time on, as well as information on your audience demographics. They also keep you informed of trends in social media. For example, earlier this month, I read a post that said baby boomers were more likely to use Google+ or Facebook rather than Twitter. This helped me focus more on my Google+ profile (which I hadn’t done much with previously) since that age group is the main demographic for my practice. Whether you have time to do regular email newsletters or not, email addresses are important to maintain. Social media fads will come and go, but if you have the email addresses of your audience, you will always be able to keep in touch with them and continue to build your practice or brand. These are also simple to use and help with demographics and shaping what people are interested in hearing from you. When you’re first starting out and aren’t quite busy yet, take that opportunity to create future newsletters with general seasonal information, so that when you are busy, you can simply make a few updates and schedule them out. Smartphones can provide an effective means of checking in on patient adherence helping to build relationships between you and your patients. Many available mobile applications allow for healthcare professionals to track and/or remind patients about dosing instructions and lifestyle recommendations. This information and adherence can then provide great discussion points for check ins. 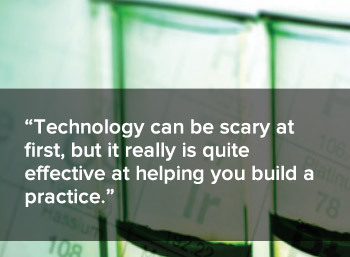 Technology can be scary at first, but it really is quite effective at helping you build a practice. A little bit of help makes a world of difference and can significantly make your practice building both efficient and productive. Dr. Kristen McElveen graduated from National College of Natural Medicine (NCNM) in 2007. After two years of residency at NCNM, she moved back to the East Coast where she started her private practice, Bare Medicine, in Springvale, Maine in 2009. As well as managing her practice, Dr. McElveen also consults for NDs and other healthcare providers on marketing, social media and practice/clinical management. Her book, Tips on Creating a Successful Naturopathic Practice: Based on the Ups and Downs of a ND in Private Practice, is currently available on Amazon.